Needless to say, Ho Chi Minh City is the most crowded and exciting metropolis of Vietnam. Whether it’s in the daytime or at night, you would always feel the noisy but interesting atmosphere thanks to the joy coming from every kinds of amusement that happens all day in the city. Once coming to Ho Chi Minh, apart from visiting some historical sites or hanging around Ben Thanh Market going shopping, you can find the heat from the coffee shops, the bars or the swimming pool which are located on the top, the rooftop Saigon, of a building, giving you a bird’s eye view of vibrant Saigon, Ho Chi Minh City. If you are fond of them, let’s take a look at some of our suggestions below for some rooftop bar/cafe of Saigon. If you are in Ho Chi Minh City, you will definitely know about the Bitexco tower, the tallest building in Saigon locating on Hai Trieu Street and near the Nguyen Hue Pedestrian Street. On the 50th floor of this building, there is a famous coffee shop where you can sit and take a cup of coffee watching the sightseeing especially in the evening when the lights come out, called the Eon Coffee Shop. What can be more exciting than drinking and looking out of the bird’s eye view of the Nguyen Hue Street as well as the whole district like you are sitting near the clouds. What’s more, once coming to Bitexco tower, you cannot ignore the 49th floor of the building which has the Saigon Skydeck whose ticket is 200,000 vnd. To get views throughout the city with 360 degrees, you can ask a staff of the tower at the ground floor. Standing at 76 Nguyen Thi Minh Khai Street, it is on the roof of the Hotel Des Arts, considered as the luxurious place people coming to enjoy the fresh water of the swimming pool as well as the exciting air of the bar when the dark rises up. The swimming pool opens from 6AM to 10PM. However, the only setback is that only visitors living in the hotel can swim. So generally, people come there to enjoy drinking at the bar nearby – the Social Club Rooftop Bar. 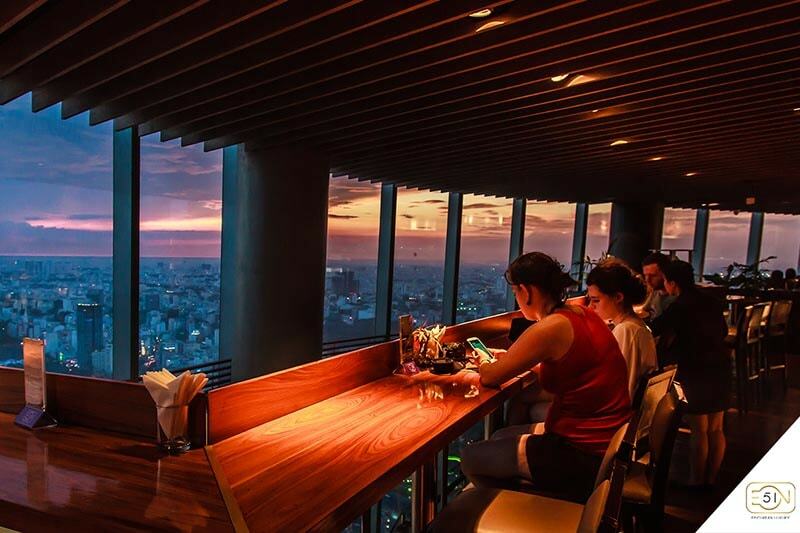 Having to say, Social Club Rooftop Bar is an ideal place to overlook the glittering skyline from above Saigon. With the set-up of several standing tables and armchairs, this phenomenal place invites guests with ease to sip a cooling cocktail and unwind in the breezy atmosphere of Saigon. Things become more vibrant with the ambient music and DJs when the sun sets. Secluded far in the right side is the highest rooftop infinity pool in the city. The water looks irresistibly attractive in a calm afternoon, just awaits you and invites you to dive in as the sun is out and the sky is infinite. Impressed yet is the first and only glass suspension bridge up in the middle of the air in Ho Chi Minh City, connecting between the hotel and Centec Tower. 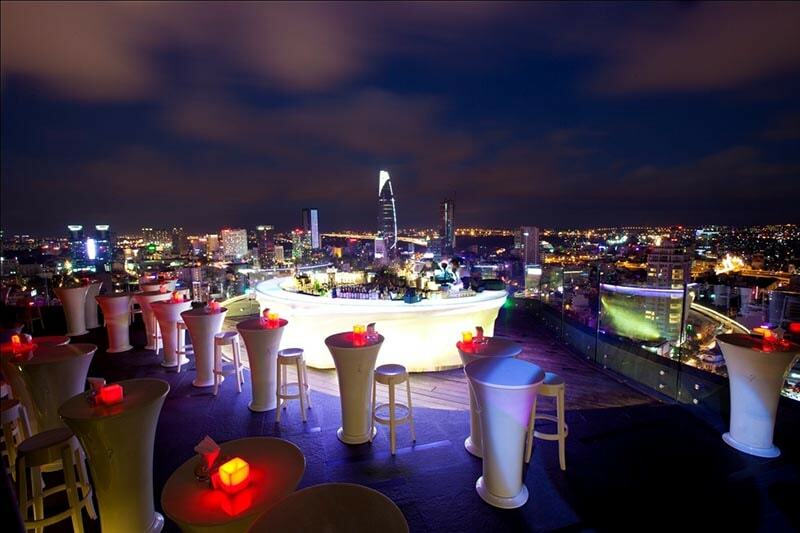 Uber Cool with a stunning view of downtown Saigon, Chill Skybar is one of the most popular nightspots in the city. 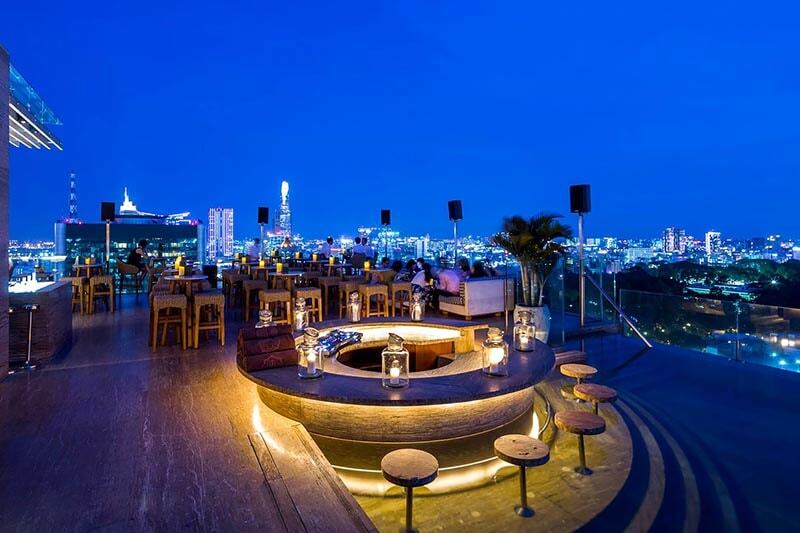 This rooftop bar Saigon and clubs sits on the 25th floor of AB Tower and attracts a lively crowd who are dressed to impress and keen to party. There is a strictly enforced dress code at Chill Skybar so make a little effort if you plan to enjoy a cocktail up here and definitely don’t wear Birkenstock or flip-flops. The bar opens at 17:00, an hour or so before sunset, and plays down tempo, chill out music through dusk, before livening things up around 22:00 when the DJ spins popular hip hop and dance music. Unlike other cocktail bars in Saigon, there is a dance floor inside Chill Sky Bar which becomes packed with the city’s glitterati on weekends. Those are the three famous rooftop destinations that we highly recommend you join in once you come to visit Ho Chi Minh. Only with a few words cannot transfer all of the outstanding features of those places. 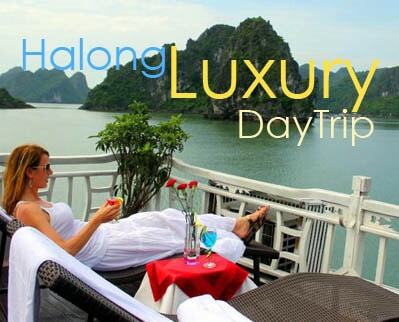 What you can do is to find the way to reach them and enjoy your amazing night in Saigon.